ST. PAUL, Minn. — If you’re a Democratic activist (and a classic rock aficionado) in Minnesota, the fact that the star-studded “Vote For Change” tour planned only one solitary show in the North Star State while inundating other swing states with half a dozen concerts might have seemed like a snub. But for those lucky few that attended the concert Tuesday night in St. Paul’s Xcel Energy Center, they saw a rare alignment of “stars” — classic rock royalty like Bruce Springsteen, John Fogerty, R.E.M., Bright Eyes and a surprise appearance by Neil Young — that they’ll likely never see again and more than make up for the slight. It was the kind of lineup the Rock And Roll Hall of Fame tries to marshal every year. While it’s arguable that all these veterans are creatively over-the-hill (Bright Eyes excepted), they demonstrated on this night that united together and fired with a purpose, they can still get a crowd on their feet and exhilarate and exhaust them with a bombardment of radio classics from yesteryear. The pro-Democrat, 36-date tour has targeted 11 swing states, including Florida, Michigan, Ohio and Wisconsin. The shows are essentially fundraisers for America Coming Together, a liberal-leaning voter mobilization program, and are being presented by the political action committee for MoveOn.org. Other performers playing at select dates include Pearl Jam, Dave Matthews Band, Dixie Chicks, John Mellencamp, James Taylor, Ben Harper, Jackson Browne, My Morning Jacket, Death Cab For Cutie, Jurassic 5, Bonnie Raitt, and Tracy Chapman, among others. Tuesday’s show did attract at least a dozen protesters position across the street from the arena, anyone who seems surprised any of these artists are taking a political stance just hasn’t been listening very carefully to these artists’ music. (Maybe these fans are as lazy lyric readers as former President Ronald Regan’s handlers, who mistakenly tried to use Springsteen’s “Born In The U.S.A.” during the 1984 campaign believing it was a patriotic anthem). Like the folk music hootenannies of the ’60s, this show seemed more about reassuring the faithful and preaching to the choir than attracting new recruits. The nearly sell-out crowd (which included members of Minnesota’s own Jayhawks) — mostly white and middle-aged — applauded at each artists’ between-song political pronouncements and most sported some form of Kerry advertisement on their body. Show opener Bright Eyes was an impressive appetizer, and band svengali Conor Oberst’s singing and playing radiated more youthful fervor than all the musical giants that he’d later share the stage with. Appearing as unkempt as his music often is on record, Oberst delivered a surprisingly tight and soulful half-hour set. Oberst was armed only with an acoustic guitar and sneered lyrical nuggets like “greed is a bottomless pit” and “live by your conscience” that could have been used as an audition to be the new poster boy for protest music. He seemed more succinct and emotionally powerful than how overly loquacious and whiny he comes across on disc. His songs traverse the familiar paths of American roots music (folk, country-rock, southwestern and hillbilly) and he and his five-piece band were highly adaptable, out of control and explosive on some cuts and then equally sensitive on the down tempo material. By contrast, R.E.M. was the picture of steady confidence. Introduced by Springsteen as “one of the great American bands,” the group gave a businesslike reading of 12 songs from throughout their back catalogue (and a couple of new ones from their forthcoming record) that were each flawless, but too frequently mismatched in their energy levels. The band — consisting of the core trio and augmented by a touring drummer and a pair of sidemen — played similarly as they have in recent years. Vocalist Michael Stipe is still the upbeat cheerleader, working the crowd and performing a spastic form of Tae Chi between the verses while guitarist Peter Buck keeps doing an odd form of stage ballet for a man of his size. Decked out completely in white, Stipe rarely glanced at the teleprompter at his feet or music stand to his right. He was in good voice and seemed to get off on the audience’s friendly reactions. While he’s never shied away from making political statements, his stage banter often can be curt. Tuesday night’s supportive environment drew him further out of his shell more. “I do believe I’m not alone,” Stipe yelled at the end of “Final Straw,” much to the crowds’ cheers. When it was the Boss and the E Street Band’s turn, they were something of greatest hits jukebox for more than two hours. Despite a relentless pace, they powerfully a string of Springsteen’s own hits and then those of whoever joined them onstage. Thirty years of road work, the group members are master accompanists. They attack the song when Springsteen commands with a wall of sound that can bulldoze the front rows. But, they can just as easily pull back to create the kind of atmospherics for the slow songs. With his bandmates around him in the shadows, Springsteen launched into a solo version of the “Star-Spangled Banner” played on an acoustic 12-string guitar. Bathed in a single spotlight behind his head, he hit the strings with broad, flamenco-like strokes to create a flurry of clanging notes. That was followed by a forceful version of “Born In The U.S.A.” — complete with that famous ’80s synthesizer lick — kicked the show into high gear. The group’s four guitar players created a sustained roar that was only surpassed by Weinberg’s thunderous drumming. Youth anthems like “Badlands” and “No Surrender” were equally explosive and had the crowd pumping their fists during the choruses. Songs like “The River” and “Johnny 99” were used as individual showcases. Nearly each member of the group got a turn to solo during “Johnny 99” while Bruce’s shouted the lyrics like he was a field hand and not a working class troubadour. “The River” belonged to Springsteen. Soaked in sweat, he played harp and lead the rugged-sounding band to the song’s conclusion with by singing wordless with his falsetto. Young then joined the group for a bombastic take “Souls Of The Departed” and a red-hot “All Along The Watchtower” that recalled Jimi Hendrix. “Any Canadians in the house? I though I saw one earlier,” Springsteen said as introduction. Young and Springsteen traded verses and guitar solos, but it was Young who was again essentially calling the shots. With Springsteen looking on intently and the rest of the E Street Band marginalized, Young hijacked the show with his furious guitar riffs and jumbled, screechy solos. Young doesn’t sound like he’s playing guitar, but rather like he’s trying to wrestle with a firehose. Young’s presence was a wild card that Springsteen clearly appreciated and was responsible for some of the nights most exhilarating moments, like when he brought the crowd to their feet during “Watchtower” by lifting his head up from his guitar and pulled the song to a climax by singing the “two rider were approaching” line with Springsteen. While Young feed on chaotic improvisation, Fogerty established an irresistible groove that left Springsteen with a giddy look on his face. The good spirits continued even when Fogerty messed up the lyrics to “Fortunate Son.” The song took off like a rocket with Weinberg’s drumming and Fogerty’s raucous playing, and he seemed to lose himself in the excitement. Things finally peaked when Young, Fogerty and the other tour members all came together for Young’s “Rocking In The Free World.” Neil yelled out the song’s lyrics as the collective musicians played the song’s menacing three chords. The bubble finally broke when Young took another extended tone-poem-like solo that left Fogerty and others in awe. Springsteen took the motley group through renditions “(What’s So Funny About) Peace Love And Understanding” and “Power To The People” with Oberst, Stipe and Fogerty trading lines. 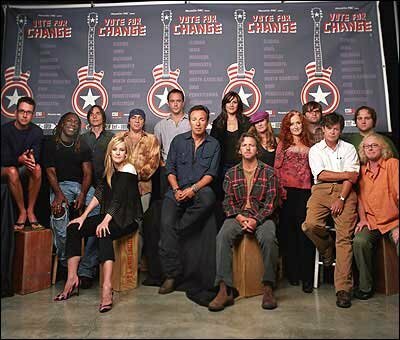 Tags: "Vote For Change", 2004, Bright Eyes, Bruce Springsteen, Conor Oberst, Democratic, E Street Band, election, George W. Bush, John Fogerty, John Kerry, Michael Stipe, Mike Mills, Minnesota, moveon.org, Neil Young, Peter Buck, R.E.M., St. Paul, Twin CIties, Xcel Energy Center. Bookmark the permalink.